WBO world heavyweight champion Joseph Parker has "rattled" Anthony Joshua with the pair close to agreeing a 2018 bout, says promoter David Higgins. 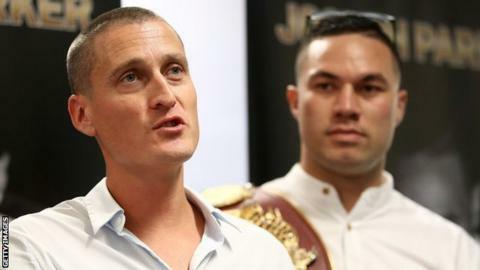 Parker recently held a news conference featuring clips of Joshua being knocked down, prompting the WBA and IBF title holder to say he was being "demonised". "I think Joseph Parker has won round one," Higgins told BBC Sport. "Joshua is rattled because he knows his chin is dodgy and Joseph's isn't. So Parker has a mental edge." Higgins wants 25-year-old Parker to receive 35% of revenue from the bout and says talks are now "very close" with "just a few percentage points" of "compromise" from Joshua's team necessary. During a BBC Sport interview on 8 December, Joshua discussed Parker's controversial news conference and pointed to athletes in other sports - including tennis -showing more respect to their peers. "Some of what Joshua is saying is bonkers," added Higgins. "You saw a rattled Anthony Joshua talk of being demonised. "He was going on about Roger Federer - Federer won all the tournaments. He didn't turn around and say 'I wont play Wimbledon because I want an extra few percent'. "I think he is showing mild delusions of grandeur in talking about Federer and also mild delusions of persecution when he says Joseph is demonising him." Higgins says November's news conference was a "blunt instrument" to promote debate over what is a fair split and on which fighter has the better chin. A date for the proposed bout in March or April makes sense to the Duco Events boss, who stressed no date or venue is yet in place. Neither fighter has been beaten and while Joshua, 28, would start a heavy favourite, Higgins insists the bout is a "lot closer to 50-50 than a one-horse race". He added: "The British media have hyped Joshua. Look at the records and Joshua beat an aging Klitschko and got flattened during the fight. That aside, a lot of the opponents have shocking records and then there is the fact he is chinny. Contrast that to Parker. "Joshua comes forward, His footwork is not that flash. He is perfect for Parker. "Joshua can't unify without beating Parker or WBC champion Deontay Wilder. He needs Parker and Parker has been on the pads since he was four years old so I think he deserves a fair pay day. I think even the British fans will think that is fair. "Joshua has to now unify with Parker or Wilder. Otherwise what he says is all hot air. It has got to the point where I think the media will finally hold him to account." Read more on Concussion in sport: Are safety and equality compatible in women's boxing?